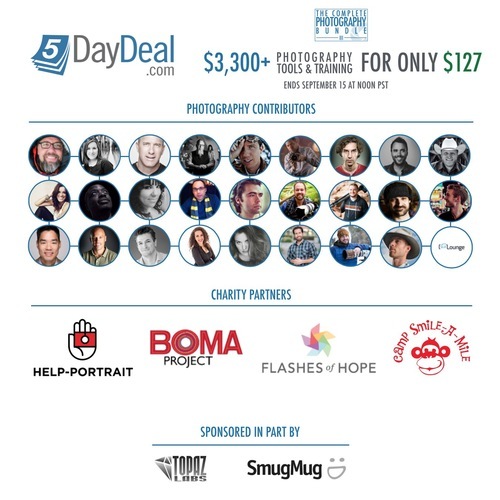 5 Day Deal: Learn from photography professionals, help those in need and get incredible giveaways! Simply CLICK HERE and signup to win for free. Johny: Hey guys what’s up? Its Johny here and welcome to a very special episode of the Share Inspire Create show. I’m here with my main man B. How are you my brother? Brent: Man I’m awesome and guys what we got today is called the 5 Day Deal. It only happens for 5 days and it happens once a year. It’s super important that you guys jump into it right now and we’re gonna tell you all about it. Johny: And you guys have to get on to this. It’s a must and it’s absolutely epic value. It’s incredible. And the price that you can win is just extraordinary mate. Brent: So what is a 5 Day Deal? Johny: Tell me about it. Brent: Okay so once a year a bunch of photographers get together. They put all their bundles there, products together. All their courses and they give it you in a massive discount like I don’t know 90% off or something. Johny: We’re talking 20 or something of different photographers. It’s amazing man. So many different products across all genres of photography. It’s just great. When you’re starting out learning photography or even if you’re season pro man it’s something for you in this package. It’s amazing. Brent: That’s the world’s largest bundle of photography training courses. It’s crazy. And this year I’m in it. Johny: You know what’s really exciting? Johny: As the fact you’ve got your kid’s course in it. That course has been one of your best-selling courses mate. And it’s just incredible. I love it that course. And you’ve gone and put it in this and you can get it for absolute value. Brent: The 5 Day Deal is just like over a hundred bucks. And my kid’s course is 97 bucks. So basically you get my kid’s course plus like another 21 other course for basically the price for my kid’s course. Brent: I will jump in guys. Jump in and it only happens for 5 days and it’s over like you cannot get it after that. Brent: So if you’re watching this guys I suggest you jump and click the link above or below or wherever it is and grab this 5 Day Deal while it’s happening because once it’s over, it’s over. Johny: You know what I love mate? Some of the people who have gotten into this stuff. Brent: Let’s have a look. Johny: We’ve got Serge Ramelli, Jasmine Star, Nicole S. Young, Trey is in there. Brent: I know it’s amazing. Brent: Also O’Donnell he’s got some great stuff. Johny: This guy Brent Mail too. Brent: He must be a superstar. Johny: Alright so anyway you can see in there absolutely awesome photography teachers in there. And some awesome products for you to grab. Brent: And guys the best thing about this deal is that they give 10% to charities. So they give it away. 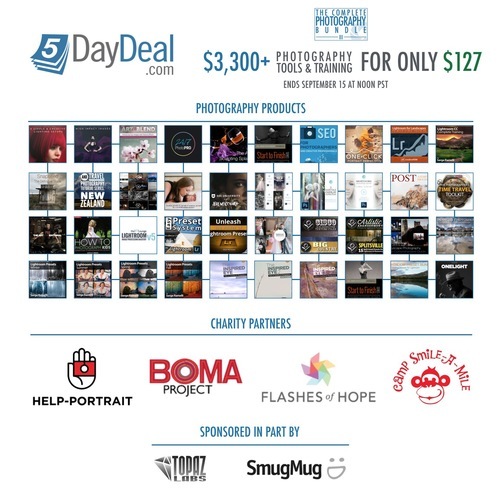 So your money that you actually paying and you get all these amazing courses for a really huge discount some of that money goes back and helps charities like for instance Help-Portrait which is one I’m passionate about coz I’ve said I’d have Help-Portrait in my area. Johny is my partner. Johny: We’re partner now of 2 years for Help-Portrait. Brent: So that’s why we help out for this where you find people in your community in need. You photograph and give them an image before Christmas. It’s just a really good thing. So what are the charities? 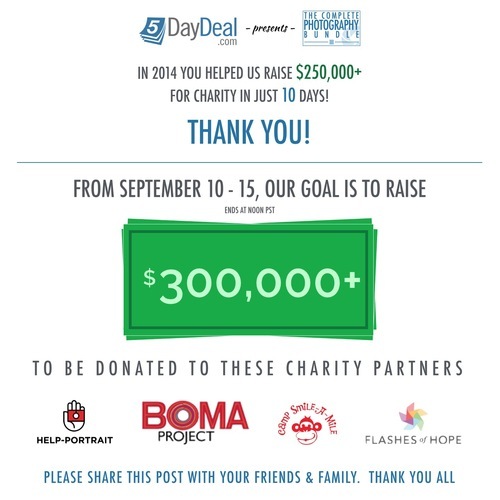 The Boma Project which helps I think people in Africa. Johny: It helps women starts business in rural areas which is absolutely amazing. There’s also the Camp Smile-A-Mile which helps kids with cancer. There’s also Flashes of Hope. Brent: Great charity. You can feel good about it actually to spending money, getting a great deal and helping up people. Johny: Absolutely love it. You know what? There’s something even bigger about this deal which is absolutely incredible. Man $50,000 giveaway. Johny: Man that is insane. And not just giveaways, we’re talking Mac computers, iPads, cameras, Canon cameras, Sony cameras. Johny: Adobe software, printers, man there’s just some amazing stuff you know all these other courses you get. It’s just so much stuff. Brent: Check on the link. Go sign up. Johny: Check it out guys. Brent: Get this package. Sign up for the giveaways, the $50,000 worth of giveaways. And enjoy the courses guys and I know that my course us great in there but there are some other great courses. I’ve been looking at a few of them like for instance Jasmine Star, like the super hero wedding photographer. She’s got like behind the scene on how to pose, the bride and the groom. You know shooting portraits, it’s just amazing. I’m loving the courses. All sorts of post processing stuffs. Johny: Josh Cripps lots of stuff in there. It’s just so much. It covers every genre. Studio, there’s landscapes, kids, man whatever you want it. Brent: Lots sorts of actions like Lightroom actions and pre-sets and all that stuffs. So guys go grab it. Look Johny and I we never promote things. Brent: We never from other people’s stuff because you know we just don’t normally believe in it. But this we totally believe in it. 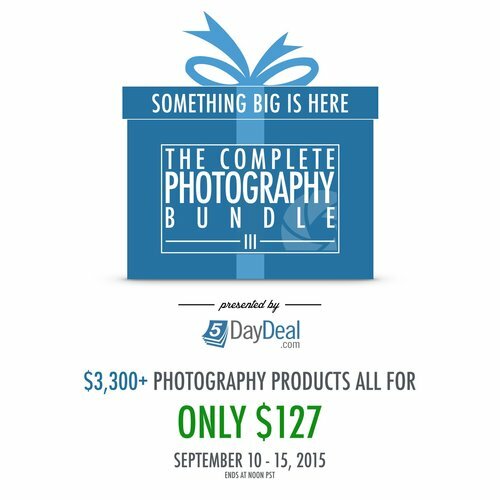 You know I saw it last year and I jumped and it was just amazing bundle and amazing value for photographers. Johny: I picked it up last year too coz there’s just so much there. It’s just amazing man. Brent: So if there’s only one product that you’re gonna buy this it. Johny: Beside the SIC lounge membership of course. Brent: Definitely and by the way guys within this package there’s a little special thing for getting into the Share Inspire Create lounge, our community. Once you actually buy this package have a look for the discounted link somewhere and you can get in for a really good deal too. Johny: That’s an ultimate deal. We’ve never had a deal like this. Brent: I’m never gonna mention it in here. What it actually is. Johny: You need to actually buy and see it. It’s just amazing man. It’s huge man. I just believe in this stuff. There’s like 12 months of stuff that you can consume. Brent: It may take you longer Johny. There’s a lot of stuff there. I mean I’ve been downloading the videos and like can we have the fastest internet. It’s taken me 3 days just to get the videos done. Johny: Got to get the hamster running in the wheel. Brent: But where you are you might have the fastest internet and it might only take a few hours for you to download the video. So guys if you do buy this bundle and I hope you do because you only have 5 days to do it. Grab this special for the lounge and I’ll see you in the lounge. Johny: We’ll see you there. Enjoy the bundle and we’ll catch you in the lounge. Brent: See you next week guys.